After much drama leading to this year’s open enrollment for Affordable Care Act coverage — a shorter time frame, a sharply reduced federal budget for marketing and assistance, and confusion resulting from months of repeal-and-replace debate — the final tally paints a mixed picture. With all states now reporting, ACA plan enrollment ticked downward this year, a report out Wednesday shows, but states running their own marketplaces saw slight gains and did better than those relying on the federal exchange. About 11.8 million Americans enrolled in 2018 coverage, down 3.7 percent from last year’s total, according to the National Academy for State Health Policy. Open enrollment began shortly after the Trump administration sharply cut federal enrollment outreach efforts and ended a type of cost-sharing subsidy paid directly to insurers, which generally responded by raising premiums to make up for the loss. “Despite all that, enrollment in the marketplaces across the nation was remarkably stable,” said Trish Riley, executive director of the academy, a nonprofit, non-partisan group. Enrollment in marketplaces fully or partially run by states, for example, showed a small overall increase of 0.2 percent over the previous year, while the 34 states that rely entirely on the federal hub saw sign-ups drop by 5.3 percent, the report said. Officials from states operating their own exchanges said their ability to make changes led to their gains. “We could extend our open-enrollment period, control our marketing budget and nimbly mitigate the impact of the loss of cost-sharing subsidies [to insurers], which led to a very successful open enrollment,” said Zachary Sherman, director of Rhode Island’s state-run market. Enrollment there is up 12 percent this year, he said, with sharp increases in the number of newly enrolled and policyholders aged 18 to 34. California, which has the nation’s largest state market with about 1.5 million enrollees, saw a 2.3 percent drop in overall sign-ups. Covered California Director Peter Lee attributed some of that to efforts by the state to encourage off-market purchases by consumers who don’t qualify for subsidies. Marketplace plans were more expensive than those sold outside healthcare.gov for unsubsidized consumers because California and other states asked insurers to load the premium increases stemming from Trump administration directives onto on-market plans. Those on-market price hikes were largely offset by jumps in tax credits for consumers receiving subsidies. Despite their upbeat tone about this year’s enrollment, directors of several state marketplaces warned that 2019 looks grim. “Just the removal of the [individual mandate penalty in Congress’ recently enacted tax overhaul] will mean premiums go up 15 percent to 30 percent or more depending on the state,” said Lee. Lt. Gov. 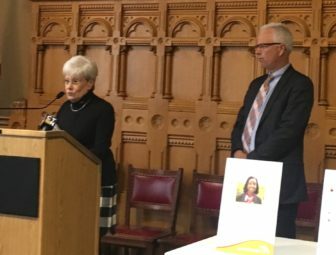 Nancy Wyman and Access Health CT CEO Jim Wadleigh at a press conference reviewing Connecticut’s recent ACA enrollment results. People who get subsidies will be largely shielded from those increases because the subsidies rise along with the premiums. Still, the burden of higher premiums would fall on the 6 million or so people who buy their own insurance but don’t get a federal tax credit to help them purchase coverage, according to an earlier study done by Covered California. The median income of those consumers was $75,000. The report also showed that enrollment dropped sharply in some states. Arizona, Louisiana and West Virginia, for example, all saw enrollment falling by more than 15 percent, which may also not bode well for 2019. Health plans are likely to raise rates there “because drops in enrollment already mean bad risk,” such as greater numbers of older or sicker members, California’s Lee warned. Congress should act soon to mitigate those expected increases, according to the five state exchange directors who participated in a press call detailing the report’s findings, by providing funding for states to create reinsurance programs, which pay insurers for medical costs for the most expensive enrollees. Several states, including Alaska and Minnesota, already have reinsurance programs. Legislation to provide such funding is before Congress. While the proposals have bipartisan support – and the idea is endorsed by many health industry groups – the legislation faces opposition from some lawmakers who see it as a bailout for the insurance industry. Allison O’Toole, the CEO of Minnesota’s state insurance marketplace, invited those who are skeptical to look at her state’s reinsurance program. Several states, including Rhode Island, are also looking at steps they can take independent of congressional action to prepare for next year. One idea: the use of state penalties for people who go uninsured to replace the loss of the individual mandate’s federal tax fine. Without some kind of mandate to purchase coverage, Rhode Island estimates that premiums there could rise 50 percent over three years. “The idea that premiums would go up at that rate is something that scares us quite a bit,” said Sherman.